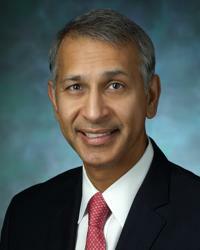 Vinod Thourani, MD, is Chairman of the Department of Cardiac Surgery at MedStar Heart & Vascular Institute which includes the cardiac surgery programs at MedStar Washington Hospital Center and Union Memorial Hospital. He is a Fellow of the American College of Surgeons, the American Board of Thoracic Surgery, and the American College of Cardiology. As a highly-experienced cardiothoracic surgeon, Dr. Thourani specializes in the treatment of adult cardiac disease, such as valve disease, coronary artery disease, aortic aneurysm, and arrhythmia surgery. He is unique in that he is able to perform these procedures using traditional open surgical, minimally invasive, and transcatheter techniques. “My highest priority is to provide personalized, exemplary care by giving patients options for new innovative technologies relevant to their diagnosis. My goal is to provide the most optimal patient care utilizing the most appropriate procedure in order to minimize recuperation time and, most importantly, achieve long-lasting, quality results.